The 1964 Summer Olympics, officially known as the Games of the XVIII Olympiad (Japanese: 第十八回オリンピック競技大会, Hepburn: Dai Jūhachi-kai Orinpikku Kyōgi Taikai), was an international multi-sport event held in Tokyo, Japan, from 10 to 24 October 1964. Tokyo had been awarded the organization of the 1940 Summer Olympics, but this honour was subsequently passed to Helsinki because of Japan's invasion of China, before ultimately being cancelled because of World War II. The 1964 Summer Games were the first Olympics held in Asia, and the first time South Africa was barred from taking part due to its apartheid system in sports. (South Africa was, however, allowed to compete at the 1964 Summer Paralympics, also held in Tokyo, where it made its Paralympic Games debut.) Tokyo was chosen as the host city during the 55th IOC Session in West Germany, on 26 May 1959. These games were also the first to be telecast internationally without the need for tapes to be flown overseas, as they had been for the 1960 Olympics four years earlier. The games were telecast to the United States using Syncom 3, the first geostationary communication satellite, and from there to Europe using Relay 1. These were also the first Olympic Games to have color telecasts, albeit partially. Certain events like the sumo wrestling and judo matches, sports huge in Japan, were tried out using Toshiba's new colour transmission system, but only for the domestic market. History surrounding the 1964 Olympics was chronicled in the 1965 documentary film Tokyo Olympiad, directed by Kon Ichikawa. The games were scheduled for mid-October to avoid the city's midsummer heat and humidity and the September typhoon season. The previous Olympics in Rome in 1960 started in late August and experienced hot weather. The following games in 1968 in Mexico City also began in October. The 1960's Olympics were also the last to use a traditional cinder track for the track events. A smooth, synthetic, all-weather track was used for the first time at the 1968 Olympics and at every Olympiad thereafter. Tokyo won the rights to the Games on 26 May 1959, at the 55th IOC Session in Munich, West Germany, over bids from Detroit, Brussels and Vienna. Toronto was an early bidder again in 1964 after the failed attempt for 1960 and failed to make the final round. Yoshinori Sakai running to the Olympic cauldron. Yūji Koseki composed the theme song of the opening ceremony. Yoshinori Sakai, who lit the Olympic flame, was born in Hiroshima on 6 August 1945, the day an atomic bomb was dropped on that city. Kumi-daiko was first exhibited to a worldwide audience at the Festival of Arts presentation. Judo and volleyball, both popular sports in Japan, were introduced to the Olympics. Japan won gold medals in three judo events, but Dutchman Anton Geesink won the Open category. The Japanese women's volleyball team won the gold medal, with the final being broadcast live. The women's pentathlon (shot put, high jump, hurdling, sprint and long jump) was introduced to the athletics events. Reigning world champion Osamu Watanabe capped off his career with a gold medal for Japan in freestyle wrestling, surrendering no points and retiring from competition as the only undefeated Olympic champion to date at 189–0. Soviet gymnast Larisa Latynina won two gold medals, a silver medal and two bronze medals. She had held the record for most Olympic medals at 18 (nine gold, five silver, four bronze) which stood until broken by American swimmer Michael Phelps in 2012. Czechoslovakian gymnast Věra Čáslavská wins three gold medals, including the individual all-around competition, crowning her the new queen over the reigning champion Larisa Latynina. Australian swimmer Dawn Fraser won the 100 m freestyle event for the third time in a row, a feat matched by Vyacheslav Ivanov in rowing's single scull event. Don Schollander won four gold medals in swimming. 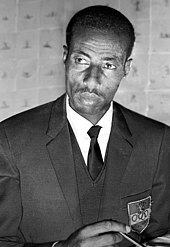 Abebe Bikila (Ethiopia) became the first person to win the Olympic marathon twice. New Zealand's Peter Snell won a gold medal in both the 800 metre and 1500 metre. American Billy Mills, an unfancied runner, won the gold in the men's 10,000 m. No American had won it before and or since. British runner Ann Packer set a world record in becoming the surprise winner of the 800 metre, having never run the distance at international level before the Games. Bob Hayes won the 100 metre title in a time of 10.0 seconds, equaling the world record. He had run a wind-assisted 9.9 seconds in the semifinal, but this was not recognized as a world record. He later won a Super Bowl ring as a wide receiver for the Dallas Cowboys and was the second gold medalist elected to the Pro Football Hall of Fame (following Jim Thorpe). Joe Frazier, future heavyweight champion of the world, won a gold medal in heavyweight boxing. This was the last Summer Olympics to use a cinder running track for athletic events, and the first to use fiberglass poles for pole vaulting. The nation of Malaysia, which had formed the previous year by a union of Malaya, British North Borneo and Singapore, competed for the first time in the Games. The start of operations for the first Japanese "bullet train" (the Tokaido Shinkansen) between Tokyo Station and Shin-Ōsaka Station was scheduled to coincide with the Olympic games. The first regularly scheduled train ran on 1 October 1964, just nine days before the opening of the games, transporting passengers 515 kilometres or 320 miles in about four hours, and connecting the three major metropolitan areas of Tokyo, Nagoya, and Osaka. The 1964 Summer Olympics featured 19 different sports encompassing 25 disciplines, and medals were awarded in 163 events. In the list below, the number of events in each discipline is noted in parentheses. Note: In the Japan Olympic Committee report, sailing is listed as "yachting". These are the top ten nations that won medals at the 1964 Games. Conventionally, countries are ranked by the number of gold medals they receive, followed then by the number of silver medals and, finally, bronze. A total of 93 nations were represented at the 1964 Games. Sixteen nations made their first Olympic appearance in Tokyo: Algeria, Cameroon, Chad, Congo, Côte d'Ivoire (as Ivory Coast), Dominican Republic, Libya (but it withdrew before the competition), Madagascar, Malaysia, Mali, Mongolia, Nepal, Niger, Northern Rhodesia, Senegal, and Tanzania (as Tanganyika). Northern Rhodesia achieved full independence as Zambia on the same day as the closing ceremony. Athletes from Southern Rhodesia competed under the banner of Rhodesia; this was the last of three appearances at the Summer Olympics by a Rhodesian representation. Zimbabwe would later make its first appearance at the 1980 Summer Olympics. Athletes from East Germany and West Germany competed together as the United Team of Germany, as they had done previously in 1956 and 1960. Indonesia was banned from the 1964 Olympics, due to its refusal to allow Israeli and Taiwanese athletes visas at the 1962 Asian Games. Libya also took part in the Opening Ceremony, but its lone athlete (a marathon runner) withdrew from competition. These games were the first to be telecast internationally. The games were telecast to the United States using Syncom 3, the first geostationary communication satellite, and from there to Europe using Relay 1, an older satellite which allowed only 15–20 minutes of broadcast during each of its orbits. Total broadcast time of programs delivered via satellite was 5 hours 41 minutes in the United States, 12 hours 27 minutes in Europe, and 14 hours 18 minutes in Canada. Pictures were received via satellite in the United States, Canada, and 21 countries in Europe. TRANSPAC-1, the first trans-Pacific communications cable from Japan to Hawaii was also finished in June 1964 in time for these games. Before this, most communications from Japan to other countries were via shortwave. The start of operations for the first Japanese "bullet train" (the Tokaido Shinkansen) between Tokyo Station and Shin-Ōsaka Station was scheduled to coincide with the Olympic games. The first regularly scheduled train ran on 1 October 1964, just nine days before the opening of the games, transporting passengers 515 kilometers (320 mi) in about four hours, and connecting the three major metropolitan areas of Tokyo, Nagoya, and Osaka. Some already-planned upgrades to both highways and commuter rail lines were rescheduled for completion in time for these games. Of the eight main expressways approved by the Tokyo Metropolitan Government in 1959, No. 1, No. 4 and a portion of No. 2 and No. 3 were completed for the games. Two subway lines totaling 22 kilometers (14 mi) were also completed in time for the games, and the port of Tokyo facilities were expanded to handle the anticipated traffic. The Oxford Olympics Study established the outturn cost of the Tokyo 1964 Summer Olympics at US$282 million in 2015-dollars. This includes sports-related costs only, that is, (i) operational costs incurred by the organizing committee for the purpose of staging the Games, e.g., expenditures for technology, transportation, workforce, administration, security, catering, ceremonies, and medical services, and (ii) direct capital costs incurred by the host city and country or private investors to build, e.g., the competition venues, the Olympic village, international broadcast center, and media and press center, which are required to host the Games. Indirect capital costs are not included, such as for road, rail, or airport infrastructure, or for hotel upgrades or other business investment incurred in preparation for the Games but not directly related to staging the Games. The cost for Tokyo 1964 compares with costs of USD 4.6 billion for Rio 2016, USD 40-44 billion for Beijing 2008 and USD 51 billion for Sochi 2014, the most expensive Olympics in history. Average cost for Summer Games since 1960 is USD 5.2 billion. The 1964 Summer Olympics in Tokyo celebrated Japan's progress and reemergence on the world stage. The new Japan was no longer a wartime enemy, but a peaceful country that threatened no one, and this transformation was accomplished in fewer than 20 years. To host such a major event, Tokyo's infrastructure needed to be modernized in time for large numbers of expected tourists. Enormous energy and expense was devoted to upgrading the city's physical infrastructure, including new buildings, highways, stadiums, hotels, airports and trains. There was a new satellite to facilitate live international broadcast. Multiple train and subway lines, a large highway building project, and the Tokaido Shinkansen, the fastest train in the world, were completed. Haneda International Airport and the Port of Tokyo were modernized. International satellite broadcasting was initiated, and Japan was now connected to the world with a new undersea communications cable. The YS-11, a commercial turboprop plane developed in Japan, was used to transport the Olympic Flame within Japan. For swimming, a new timing system started the clock by the sound of the starter gun and stopped it with touchpads. The photo finish using a photograph with lines on it was introduced to determine the results of sprints. All of this demonstrated that Japan was now part of the first world and a technological leader, and at the same time demonstrated how other countries might modernize. In preparation for the games, 200,000 stray cats and dogs were rounded-up and euthanized. Unfortunately, however, the construction projects resulted in some environmental damage, forced relocations for some residents, and loss of some industries. In addition, corruption by politicians and construction companies resulted in cost overruns and some shoddy work. Although public opinion about the Olympics in Japan had initially been split, by the time the games started almost everyone was behind them. The broadcast of the opening ceremony was watched by over 70% of the viewing public, and the women's volleyball team's gold medal match was watched by over 80%. As with many other Olympics, observers later stated that 1964 Olympic preparation and construction projects had had a negative effect on the environment and lower income people. The Cary Grant film Walk, Don't Run was filmed during the Tokyo Olympics, and set in Tokyo during the Olympics. A message at the beginning of the film thanks the Japanese Government and Tokyo Police for putting up with them filming in crowded Tokyo. The Studio Ghibli film From Up on Poppy Hill takes place one year before the Tokyo Olympics. Tokyo has attempted to bring the Olympic Games back to the city, having unsuccessfully bid for the 2016 Summer Olympics, which were awarded to Rio de Janeiro. Tokyo will host the 2020 Summer Olympics and 2020 Summer Paralympics games. Tokyo will be the first Asian city to host the games twice. North Korea withdrew its athletes from the 1964 Summer Olympics just before the Games were due to start, as the IOC were refusing to accept any athletes who had participated in the Games of the New Emerging Forces (GANEFO) held in Jakarta, Indonesia, in 1963. China and Indonesia also chose not to attend the Tokyo Games due to GANEFO issues. Tokyo Olympiad, a documentary film about the 1964 Games. ^ BBC News On This Day, 18 August, "1964: South Africa banned from Olympics". ^ "Past Olympic Host City Election Results". GamesWeb.com. Archived from the original on 15 September 2008. Retrieved 23 September 2008. ^ "Paralympic Results & Historical Records for RSA". International Paralympic Committee. ^ "The Miami News - Google News Archive Search". The Miami News. Retrieved October 10, 2014. ^ Griggs, Lee (28 October 1963). "A very dry run in Tokyo". Sports Illustrated: 64. ^ "IOC Vote History". Aleksandr Vernik. Retrieved 10 October 2014. ^ "Toronto has made 5 attempts to host the Olympics. Could the sixth be the winner?". thestar.com. 24 July 2015. ^ Varian, Heidi (2013). The Way of Taiko: 2nd Edition. Stone Bridge Press. pp. 28–29. ISBN 1611720125. ^ "Olympic Games Tokyo 1964 – Medal Table". Archived from the original on 6 October 2009. Retrieved 11 October 2009. ^ "For Gold, Silver & Bronze". TIME. 16 October 1964. Retrieved 5 January 2010. ^ Martin, Donald H. (2000). Communications Satellites (fourth ed.). El Segundo, CA: The Aerospace Press. pp. 8–9. ISBN 1-884989-09-8. Retrieved 31 October 2009. ^ "Significant Achievements in Space Communications and Navigation, 1958–1964" (PDF). NASA-SP-93. NASA. 1966. pp. 30–32. Retrieved 31 October 2009. ^ a b c Droubie, Paul (July 31, 2008). "Japan's Rebirth at the 1964 Tokyo Summer Olympics". aboutjapan.japansociety.org. About Japan: A Teacher's Resource. Archived from the original on 15 January 2010. Retrieved January 10, 2010. ^ "Japan's Capital Tokyo to host 2020 Olympic and Paralympic Games". Retrieved 8 September 2013. Organizing Committee for the Games of the XVIII Olympiad (1964). THE GAMES OF THE XVIII OLYMPIAD TOKYO 1964: The Official Report of the Organizing Committee. Organizing Committee for the Games of the XVIII Olympiad. Wikimedia Commons has media related to 1964 Summer Olympics. "Tokyo 1964". Olympic.org. International Olympic Committee. "Results and Medalists — 1964 Summer Olympics". Olympic.org. International Olympic Committee.